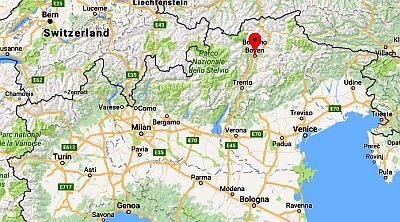 In Bolzano (Bozen in German), the capital of the province of the same name, in the Trentino-Alto Adige region, the climate is semi-continental, with cold winters and hot summers. The town lies in a valley, at 250 meters (800 ft) above sea level. The monthly average temperature ranges from 1 °C (34 °F) in January to 22.5 °C (72.5 °F) in July. The daily temperature range is generally quite high, in fact, night frosts are the norm in winter, while in summer, although days can be hot, nights remain usually cool. Precipitation is moderate, since it amounts to about 700 millimeters (27.5 in) per year; the rainiest season is summer, also because of afternoon thunderstorms, while the driest season is winter. Winter, from December to February, is cold, usually with night temperatures below the freezing point (0 °C or 32 °F) and daytime temperatures a few degrees above. Although it is a dry season, the sky is often cloudy, and at night sometimes fog can form (though much more rarely than in the Po Valley). In periods of good weather, variations in temperature between day and night can be substantial. Winter is definitely the driest season of the year, in fact it might not rain or snow for weeks. Owing to the scarcity of precipitation, snow is quite rare, although some snowfalls occur every year. On average, about 30 centimeters (12 in) of snow fall per year, as a sum of several light snowfalls. However, a more abundant snowfall may occasionally occur, around 20/30 cm (8/12 in). In Bolzano, it usually snows when the wind blows from the south: during cold spells, the city receives a wind descending from the mountains, dry and relatively mild. Although the temperature at night usually drops to around -5/-7 °C (19/23 °F), it drops below -10 °C (14 °F) only during cold spells. Here are some values recorded in the coldest winters: January 1961: -18.5 °C (-1.5 °F); February 1956: -16 °C (3 °F); January 1985: -17.5 °C (0.5 °F). In spring, daytime temperatures become rapidly milder, while nights remain cold, at least in the first part. In fine weather, the valley of Bolzano easily heats up, so already in April (and sometimes even in March) highs can exceed 20 °C (68 °F), and sometimes they can reach 25 °C (77 °F). However, Atlantic disturbances, able to bring rainfall, are quite frequent. In late April or May, the first heat thunderstorms can occur. Summer, from June to August, is hot during the day, while nights are generally quite cool. During periods of good weather, the Bolzano basin gets hot, and light wind conditions make the heat unpleasant. In these periods, temperatures can reach 34/35 °C (93/95 °F) and sometimes even higher values: for example, in July 1983 and August 2003 a peak of 39 °C (102 °F) has been recorded. However, because of its northern location, the city is reached with some frequency by the tail of Atlantic fronts, which can bring a bit of cloudiness, and even rain, while in the afternoon or in the evening a thunderstorm may break out. For this reason, the amount of sunshine in summer is not very high. Autumn, from September to November, is initially pleasant, then gradually becomes cooler, and later cold and gray. Temperatures gradually decrease, and at night it starts to get pretty cold quite early, while daytime temperatures are still mild, especially on sunny days, and even warm in September. The first night frosts are recorded typically in early November, but sometimes already in the second half of October. The rains are frequent, and from mid-October, the sun begins to be seen quite rarely. Bolzano does not get a lot of sun, at least in comparison with the Italian standard. The sun can shine all year round, but in winter, there are many gray days, and in spring and autumn, Atlantic fronts pass often enough, while in summer, in addition to some Atlantic fronts, cloudiness can develop in the afternoon, which may result in some heat thunderstorms. On average, there are 3 hours of sunshine per day in December, 7.5 in July and 7 August. The best times to visit Bolzano are spring and early summer, in particular from mid-April to mid-June. September, too, is a good month. However, you have to take into account some rainy days in both periods. Summer can be hot, although there may be some pleasant or at least acceptable periods, especially in June. In summer and sometimes in late spring, thunderstorms can break out in the afternoon or in the evening. 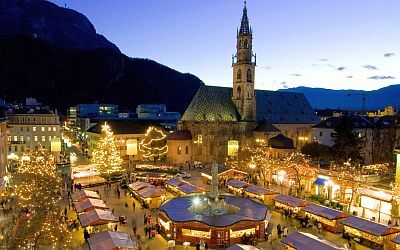 In December, Bolzano receives many tourists who come to visit the Christmas markets, while in winter and in summer, you can take a break here as part of a holiday in the mountains.